I haven't met a gardener yet who felt he had too much compost! It's the one thing you can't use enough of in your garden. Compost seems to have almost magical properties: It adds nutrients to the soil, including hard-to-obtain micronutrients. It makes sandy soils retain water and helps clay soils drain better. It attracts highly beneficial earthworms and improves microbial bacteria in the soil. Heck, it even looks good--black and rich like the most perfect soil ever. Since cold compost often contains still-viable weed and other seeds, you'll need to use it in ways where it won't matter that you're spreading seeds with the compost. • Put it in the bottom of pots and planters as a nutrient-rich potting soil. But do top the compost with at least a few to several inches of regular potting soil, which has a fluffier texture that's better for container plantings. • Use compost in the fall to mound your roses. The compost protects the base of the roses over the winter. Then, in spring, just spread it out around the base of the rose to help feed the plant. • Make it a rule to add compost to the bottom of every planting hole. Compost improves drainage and feeds the new planting. • With plantings of annuals, work in a spade or two (or several) into the general area before digging the little holes with your trowel. • Blend compost with regular soil (about half and half, depending on your soil) to fill deeper raised beds. With more shallow raised beds (those just 3 or 4 inches high) fill with pure compost, if you have enough. • Feed your lawn organically by spreading with a rake 1/4- to 1/2-inch of compost over the surfaces. 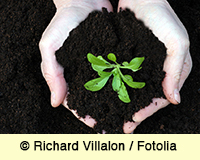 • In spring and fall, fill holes and low spots in the lawn with compost. Plant with grass seed as needed. • Mulch with 1 to 2 inches of compost on flower and vegetable beds. It creates extremely healthy, nutrient-rich soil. Hot Composting vs. Cold Composting.